What makes Gorilla Glass more durable with each generation? Gorilla Glass (GG) is one of the most recognizable brands of toughened glasses today, thanks to their marketing and widespread usage in various gadgets and automobile industry. Still, there is a new generation of GG released every few years, showing better properties with thinner samples, making me think it's all not just about ion exchange. Are there other ways of "chemical strengthening" besides cationic exchange that can be utilized to strengthen the glass, keeping it flexible and less fragile at the same time? 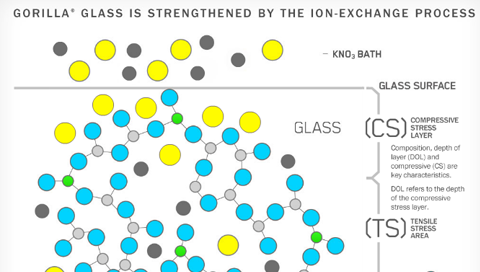 To understand why ion exchange strengthens glass, you have to understand why the ion exchange makes the glass harder. The process ion exchange hardening, its done at a temperature that allows ion diffusion, but disallows a reconfiguration of the glass structure or relaxation of bonds (below Tg). When sodium atoms are replaced by potassium in glass, the potassium ions occupy a site that is sized for sodium; this mismatch creates the compression that in turn gives the glass its scratch resistance. Thus the only way to chemically harden the glass is to substitute larger ions into the glass. Are there other ways of "chemical strengthening" besides cationic exchange... What about anion exchange? To this yes in theory if you could substitute the anions with out rearranging the structure then yes anion exchange would be another way. But as Yogi Berra once said "in theory there's no difference between theory and practice, but in practice there is." The problem with anion exchange is you would be breaking and thus relaxing the bonds of atoms that you need to remain to remain in place, thus no strengthening would occur. I suppose you could also modify the surface to make a layer of silicon nitride or carbide and call that anion exchange, but would it this strengthening glass or changing the material altogether? One way in which you could increase glass strength though still predominately a chemical process is to substitute sodium for lithium (or hydrogen), anneal the glass to allow the bonds to relax to form sites sized for lithium then substitute potassium back in where the lithium is to make it even stronger. As far as what make each generation of GG stronger, I think it is base glass improvement such as modifying the aluminum content or making the glass thinner or making the ion diffusion more local to the surface and preventing the potassium from penetration too far. To really answer this, you need to characterize the glass in terms of its properties, and not something like its ability to resist being scratched. Scratch resistance is a behaviour, and not a property. There are many ways of making something more scratch resistant. "Hardness" itself is a behaviour, and not a property. In any case, it might be that they're onto a very good toughening mechanism here, with various degrees of ion exchange, and they can tweak the process a lot and still get improvements. Controlling the ions present in the glass matrix is going to affect both the residual stresses of the total glass layer, as well as the properties of each layer. And that will affect hardness/scratch resistance and toughness. In most materials, toughness and hardness are in competition. But in a brittle material like glass, fracture needs a defect to initiate from. So if you adjust the cations present in the glass matrix to make the surface layer hard, it is potentially brittle. But if you also make it in compressive stress compared to the inner region, it become tougher. There won't be just one way to achieve this, as in its not a single optimized point, but rather a response surface. So as they understand the process better, they can move along that response surface, and show improvements every few years. Not the answer you're looking for? Browse other questions tagged inorganic-chemistry materials solid-state-chemistry glass mechanochemistry or ask your own question. What makes teflon such a strong material? What makes ceramic coated pans fail? Is it reversible? What makes a metal more inclined to bond covalently? What happens when two nitrates react with each other? What makes most all-carbon materials so strong? Chemical plating of glass with copper? What makes certain zeolites better at ion exchange?